With a sense of urgency brought on by recent Province wide pesticide bans, 2012 will likely see more residents and local policy makers questioning not only the right to add chemicals to our lawns, but also the need for its very existence. You see, increased anxiety over pesticide & fertilizer usage is only one area of concern related to the overuse of turf. In addition to relying on fertilizers and pest control products, lawns also place demands on numerous shared resources. The need for watering is the chief concern, especially in groundwater dependent areas such as Waterloo Region. Air quality and noise pollution are also major concerns. Emissions from lawnmowers, trimmers, and gas blowers add significantly to smog levels; and we all know the aggravating noises these machines make, especially on a sunny weekend afternoon. Of course you don’t have to add water and other inputs to your lawn; in which case it certainly won’t stay green, or grow very much for that matter. But then, if it didn’t grow, at least wouldn’t have to spend your Saturdays cutting it. Maybe it’s a backlash against this unending labour, rather than the health and environmental issues, which is causing more and more people to look for alternatives. What are the alternatives to the traditional lawn? A drive around Kitchener, Waterloo, Cambridge and the surrounding areas will reveal many variations on the concept, some excellent and some not so appealing. 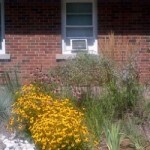 The trend has been called naturescaping, natural landscaping, and xeriscaping. These terms can be confusing and a bit misleading. Naturescaping and natural landscaping give the impression of something very wild or unkempt in your front yard, which need not be the case. Xeriscaping is a Greek term relating to dry land gardening, and encompasses the principle of drought tolerance. However, the best way to describe this trend may simply be ‘turf-free’ or ‘lawn alternative’ landscaping. Whatever it’s called, the fundamentals of drought tolerance and pest resistance are the key to its success. 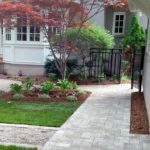 With a great variety of ground covers, shrubs, and perennials available, turf-free landscapes can be designed to fit most peoples’ needs, lifestyles, and budgets. With some creativity, anything from a low, conservative appearance to a season-long riot of colour can be arranged. 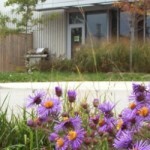 For those interested in ecology, or attracting birds, butterflies, and insects, beautiful landscape designs can include a wide variety of plants native to southern Ontario. Despite many benefits, the initial cost of a lawn alternative can be a major set-back. Unless you grow your own, or have many friends that garden, plants can be very expensive. Looking for ‘end of season’ sales is the best bet here. Some form of mulch is required for weed suppression and water retention, and can be costly depending on the square footage being covered. However, as long as a good plan is developed initially, your yard can be converted piece by piece, spreading out costs over a number of years. Lawn alternatives landscapes become rather self-sustaining over time. Another fear comes from the question of maintenance. Whereas lawn care is ingrained in our collective consciousness, the thought of gardening can be a major turn off to many. Again, as long as the concepts of drought tolerance and pest resistance are followed during plant selection, lawn alternatives landscapes become rather self-sustaining over time. Weeding and watering are important throughout the first year or two, until the plants get established. As time goes on, and open spaces fill in, watering becomes almost unnecessary and weeding minimal, depending on personal tolerance. Grass will always have its place for pets and outdoor play areas, but there are also places where it doesn’t need to be. 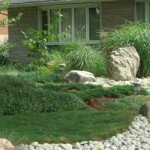 The trend towards lawn alternatives will continue to grow. If not for aesthetic reasons alone, issues such as pesticide bylaws, watering restrictions, and noise complaints will gradually push more and more citizens away from turf.